U.S. Bureau of the Census. U.S. Census of Population: 1960. Subject Reports, Migration between State Economic Areas. Final Report PC(2)-2E. U.S. Government Printing Office, Washington, D.C. 1967. The definition of residence in 1955 is consistent with the instructions given to the enumerator. As in all surveys, there were some failures to execute the instructions exactly. Through the forms distributed to households, the respondents were given explanations of some of the questions more uniformly than would have been given in direct interviews. Nevertheless, it was not feasible to give the full instructions to the respondents, and some erroneous replies have undoubtedly gone undetected. More complete discussions of the definitions of population items are given in 1960 Census of Population, Volume I, Characteristics of the Population, Part 1, United States Summary, and each of the State parts, and in 1960 Census of Housing, Volume I, States and Small Areas. This report deals essentially with the streams, i.e., the number of persons living in a given State economic area (SEA) in 1955 but in another in 1960. Specifically, the statistics give the number of in- migrants into each SBA by SEA of residence in 1955, and the number of out-migrants from each SEA to the SEA of 1960 residence. Similar statistics are presented for economic subregions. In addition, the net gain or loss experienced by each economic subregion is also given. The net gain or loss through migration between State economic areas may be found in table 31 of the report PC(2)-2B. 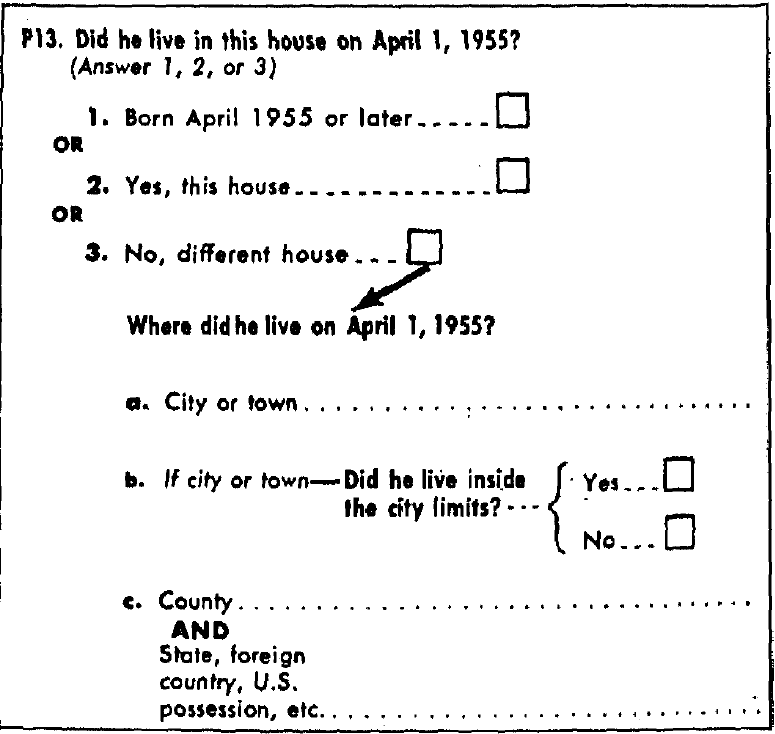 The data on residence in 1955 were derived from the answers to the questions on the Household Questionnaire shown in the next column. Persons 5 years old and over who had indicated they had moved into their present residence after April 1, 1955, but for whom, or for members of their families, sufficiently complete and consistent information concerning residence on April 1, 1955 was not collected, are included in the group "moved, place of residence in 1955 not reported." (Missing information was supplied if data were available for other members of the family.) Also included in the category "moved, place of residence in 1955 not reported" are persons who gave no indication as to their movement since April 1, 1955, hut who, on the basis of the final edited entry for year moved (for which all nonresponses were replaced by assigned entries), were classified as having moved into their present house since April 1, 1955. Alabama Fla., Ga., Miss., Tenn.
Colorado Ariz., Kans., Nebr., N. Mex., Okla,, Utah, Wyo. Dist. of Col. Md., Va.
Georgia Ala., Fla., N.C., S.C., Tenn.
Idaho Mont., Nev., Oreg., Utah, Wash., Wyo. Illinois Ind., Iowa, Ky., Mo., Wis.
Iowa Ill., Minn., Mo., Nebr., S. Dak., Wis.
Kansas Colo., Mo., Nebr., Okla.
Kentucky Ill., Ind., Mo., Ohio, Tenn., Va., W. Va.
Maryland Del., D.C., Pa., Va., W. Va.
Massachusetts Conn., N,H., N.Y., R.I., Vt.
Minnesota Iowa, N, Dak., S. Dak., Vis. Mississippi Ala., Art., La., Tenn.
Missouri Ark., Ill., Iowa, Kans., Ky., Nebr., Okla., Tenn.
Montana Idaho, N. Dak., S, Dak., Wyo. Nebraska Colo., Iowa, Kans., Mo., S. Dak., Wyo. New Hampshire Maine, Mass., Vt.
New Jersey Del., N.Y., Pa.
New York Conn., Mass., N.J., Pa., Vt.
North Carolina Ga., S.C., Tenn., Va.
North Dakota Minn., Mont., S. Dai. Ohio Ind., Ky., Mich., Pa., W. Va.
Oregon Calif., Idaho, Nev., Wash.
Pennsylvania Del., Md., N.J., N.Y., Ohio, W. Va.
South Dakota Iowa, Minn., Mont., Nebr., N. Dak., Wyo. Tennessee Ala., Ark., Ga., Ky., Miss., Mo., N.C., Va.
Texas Ark., La., N. Mex., Wyo. Utah Ariz., Colo., Idaho, Nev., N. Mex., Wyo. Virginia D.C., Ky., Md., N.C., Tenn., W. Va.
West Virginia Ky., Md., Ohio, Pa., Va.
Wisconsin Ill., Iowa, Mich., Minn. The terms "in- migrants" and "out-migrants" have been used with reference to migrants into or out of particular areas. In- migrants to an area are migrants who moved into that area from elsewhere in the United States between 1955 and 1960 and were still living there in 1960. Out- migrants from an area are migrants who were living in the area in 1955 and moved out to some other area in the United States where they were in 1960. In-migrants and out-migrants for any area exclude migrants within that area. In-migrants and out-migrants, for example, for a particular economic subregion do not include migrants between its SEA's. Thus, the sum of the in-migrants to all SEA's in any economic subregion of two or more SEA's will be greater than the number of in-migrants to that economic subregion. The term "net migration" like the terms "in-migration" and "out-migration" is used with reference to migration to or from a particular area. Net migration refers to the net gain or loss to an area through the balance of in-migration and out- migration. In the tables, net in-migration is distinguishable by a plus (+) sign and net out-migration by a minus (-) sign preceding the figure. The algebraic sum of net migration for all States and the District of Columbia is equal to zero, since a loss in one State must be compensated for by a gain in other States. The census statistics on mobility provide information on the number of movers and migrants, and on in-movement and out-movement for a given area. The census statistics, however, do not take into account all the different moves that were made in the 5-year period. For example, some persons in the same house at the two dates had moved during the 5-year period, but by the time of enumeration had returned to their 1955 residence. Other persons made two or more moves. Some movers "during the 5-year period had died and others had gone abroad. Regardless of the number of moves made, a person is counted only once as a mover in the census data. Persons who moved were not asked the number of miles they had moved. The census data, however, provide some indication of the relative distance involved in the moves. On the average, a person who moves within a county moves a shorter distance than one who moves to another county in the same SEA. He in turn moves a shorter distance than a mover to another SEA or economic subregion. A 5-year period, as chosen for use in the 1960 Census, should give a more representative picture of recent mobility than does the 1-year period that has been used in other censuses and surveys. Nonetheless, the last five years of the 1950-60 decade may have had a somewhat different mobility history from the first five years. Hence, figures on net movements computed from the statistics of this report may indicate a different net direction or suggest a different annual rate as compared with estimates for the same areas made by the "residual" method for the entire decade, even when allowance is made for variations in coverage. The data presented in this report will permit analysis of the net exchange between economic subregions and SEA's. Information on the quality of data on mobility status for 1960 is available from findings from the Content Evaluation Study (CES) of the 1960 Census, a postcensal study in which an intensive reinterview approach was used for a sample of census respondents. In the CES, measures of response error were developed with respect to selected items of information by comparing and reconciling the responses obtained in the reinterview with the corresponding census entries. Analysis of the CES data on mobility status indicates that, in general, the tendency is for the census to overestimate the more stable elements in the society and to underestimate the more mobile. The census showed fewer people living in a different State or abroad five years earlier than actually were living in a different State or abroad, and conversely, more people living in the same State, same county, and same house five years earlier than the resurvey revealed to be the case. One measure of the extent of the discrepancy is the distribution of interstate migrants in the resurvey by their classification in the census enumeration. Of those who were classified as interstate migrants in the CES and for whom mobility status was reported in the census, 85.6 percent were classified the same in the census, and the remainder were classified as having lived in the same State five years earlier (13.5 percent) or abroad (0.9 percent). The total number of interstate migrants enumerated by the census is 92.0 percent of the number estimated in the resurvey. Hence, the census also enumerated some persons as interstate migrants who, on the basis of the resurvey, actually were not interstate migrants. The two sets of comparisons taken together indicate that, in net terms, the census count is an underestimate of interstate migrants. The results of the 1960 Content Evaluation Study are not entirely comparable with those of the 1950 Post-Enumeration Survey. In considering comparative results, it should be noted that reported differences in quality may, in part, arise from improvement in procedures in the 1960 evaluation study, changes in accuracy between the 1960 and the 1950 Censuses, or both. For a more comprehensive report of the results of the evaluation studies, the reader is referred to Evaluation and ResearchProgram of the U.S. Censuses of Population and Housing: 1960, Series ER 60, No. 4, Accuracy of Data on Population Characteristics as Measured by Reinterviews, and to Bureau of the Census Technical Paper No. 4, The Post Enumeration Survey: 1950. Similar questions on mobility were asked in the 1950 and 194-0 Censuses. However, the questions in the 1950 Census, as well as in annual supplements to the Current Population Survey, applied to residence one year earlier rather than five years earlier. In the 1950 reports, migrants reporting the State but not the county of residence in 1949 appear in the known categories of migration status and State of origin, whereas in this report such persons were all assigned to the category "moved, place of residence in 1955 not reported." This partial nonresponse group comprised 411,590 migrants in 1950; the corresponding figure for 1960 is not known. Although the questions in the 1940 Census covered a 5-year period, comparability with that census is reduced somewhat because of different definitions and categories of tabulation. In 1940, the population was classified in terms of four categories: Migrants, non-migrants, immigrants, and migration status not reported. The first group, "migrants," included those persons who in 1935 lived in a county (or quasi-county) different from the one in which, they were living in 1940. The second group, "nonmigrants," comprised those persons living in the same house in 1935 as in as well as persons living in a different house in the same county or quasi-county. The group classified as "immigrant" in 1940 is comparable to the group classified in 1960 as "abroad." The 1940 classification, "migration status not reported," included persons for whom information supplied was not sufficient for the assignment of a more specific category. domicile, although, in the vast majority of cases, the use of these different bases of classification would produce identical results. The questions on place of residence in 1955 were supposed to refer to usual residence also. The respondent was not, however, furnished all the rules that the enumerator was instructed to use in determining the respondent's usual residence in 1960. Hence, in some cases, another type of residence may have been reported. towns and cities, rather than counties. The combination of counties into Stateeconomic areas has been made for the entire country, and in this process the larger standard metropolitan statistical areas (those in 1960 with a central city of 50,000 or more and a total population of 100,000 or more) have been recognized as metropolitan State economic areas. When a standard metropolitan statistical area is located in two or more States or economic sub-regions, each State part and each part in an economic subregion becomes a separate metropolitan State economic area. In New England this correspondence of standard metropolitan State economic areas and standard metropolitan statistical areas does not exist because State economic areas are composed of whole counties, whereas standard metropolitan statistical areas are built up from towns. Here, a county with more than half its population in one or more standard metropolitan statistical areas is classified as a metropolitan State economic area if the county or a combination of counties containing the standard metropolitan statistical area or areas has 100,000 inhabitants or more. State economic areas are identified by the name of the State in which they are located followed by a letter (A, B, C, etc.) or a. number (1, 2, 3, etc.). Metropolitan SEA's are identified by the letter suffix and the nonmetropolitan SEA's by the number suffix. These areas represent combinations of State economic areas. The 509 State economic areas are consolidated into a set of 121 areas which cut across State lines but which, as intended, preserve to a great extent the homogeneous character of the State economic areas. No changes were made in the boundaries of the 119 economic subregions of 1950 in conterminous United States. Two new subregions were established for the 1960 Census, one in Alaska and one in Hawaii. The SEA's comprising the economic subregions are shown in appendix A.